Lake Kremasta (Λίμνη Κρεμαστών) is the largest artificial lake in Greece begun in 1965. 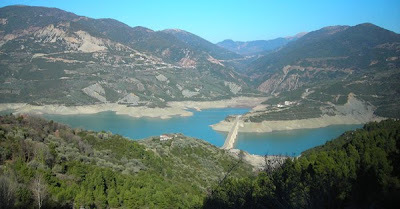 The construction of the dam of Kremasta was completed in 1969 concentrating waters from four rivers: Acheloos, Agrafiotis, Tavropos and Trikeriotis. The lake covered areas where prior to 1965 there existed twenty villages and dozens of churches and monasteries. 90,000 acres drowned and changed the lives of 2,000 inhabitants of the area. Today people call this place the "Atlantis" of Evrytania for what lies beneath these waters. 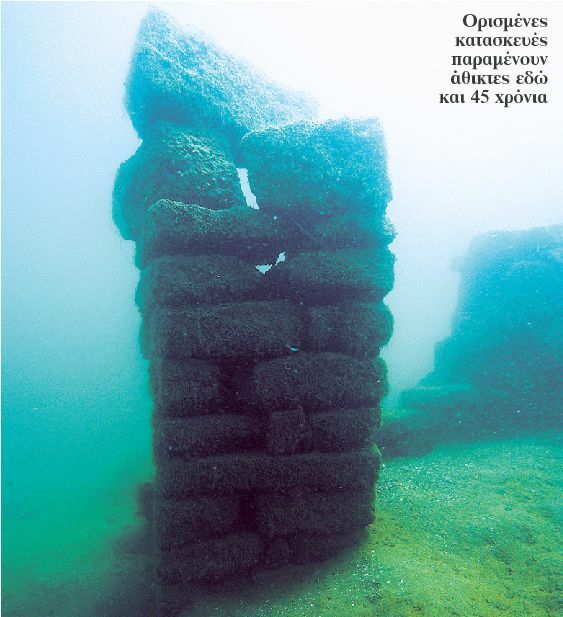 What stands out among the ruins is an 8th century Byzantine church called "Panagia of Episkopi" (Παναγία της Επισκοπής) which is being examined now by amateur divers 45 years later, according to Βήμα (01/28/2011). The mission of these divers began in May of 2008 when they sought to uncover what lay beneath the lake. They encountered much difficulty however as the lake has a depth of 30 meters to 400 meters with high levels of red soil and debri that make everything look submerged in mud. After 15 meters visibility is complete dakness, and they faced the dangers of bitter cold and underground streams. The divers accepted defeat, howevers the locals had much hope in this mission of theirs to find the church they loved and remembered. They didn't give up. 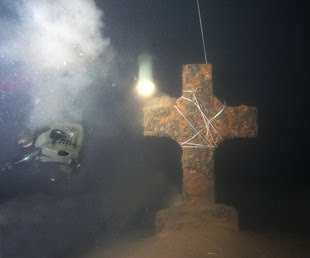 According to Christos Euthymiou, board member of the Association of Amateur Divers 'Tithys', they were not looking for the church but just came upon it. It was discovered at a depth of 40 meters; at 32 meters they could touch the dome. They were amazed to find the church still standing! After conducting research and talking to the locals who knew the area prior to the flooding, they found out more about it. The church before it was covered by the lake and after. According to Maria Salomidi: "Even though I don't believe in God, this experience had an almost religious mystique. After so much effort and suffering, with all the emotions that we brought, for us to see the dome we were filled with joy, especially because we were sharing it with the people." Archimandrite Damaskinos Vasilopoulos, a former resident of Episkopi, stated: "I was six years old when the waters covered everything and I still have memories of the violent uprooting and flight of the residents. For all of us, the fact that the church is still intact is of great importance."